The event gives you the name of the Empire that is visiting you. From there, there is a small amount of "follow the tree" down to get to your ultimate results, which is either doing a Trade Actioin, or an Attack Action. 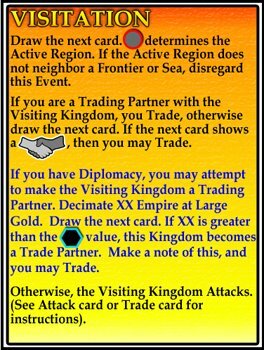 Visitors can either come in peace naturally, or come to pillage, however, if you have Diplomacy, and enough of a donation of gold, you can turn them into a Trade Partner, forever making a visit from this Empire an opportunity to do a Trade Action and avoid the nastiness of having your villages and damsels pillaged. I've new a powerful new use for Oni, the rather large, somewhat more powerful than it should be city in Samurai. 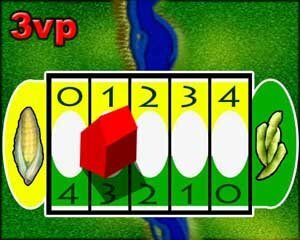 The game ends when one type of tokens is removed from the board. So, unlike almost any other city on the board, Oni MUST be captured to end the game. So, control Oni, but don't finish it, and you get to decide when the game is over, unless someone else wants to schlep you tokens. SWEET! The more i play Samurai, the more I'm convinced that the game isn't about capturing things, it's about setting things up for other player's to capture things for you, ala my Oni-ownage in this game. If you can get a ratio of only using 2 tile to capture a token or better, you are having a rockin' time. Often on BGDF, you hear enough people there complaining about "I've got an idea, but I don't know where to begin." The solution to this is easy. Begin anywhere. Getting your head wrapped around ANYTHING starts fleshing out peices of other areas. There's nothing that's rocket science to this. Oh, yeah, and also be very willing to change. There's a certain amount of letting the design pull you in the direction it wants to go, as opposed to the other way around. During the time I've spent putting together the first-pass rules of various Events in PocketCiv, it's helped me tighten up a few things, and reversed course on others. While the rules online haven't been updated to reflect this yet, I've made a choice to severely untie the Advances to the Cities. They were really knotted up together in my original incarnation; now there is only a loose association. Originally, the main reason why Advances were tied to cities was trying to keep components to a minimum; when you bought an Advance, you wrote in down in a space on the City. However, this leads to the issue of having a City destroyed also destroys whatever Advances that had accumlated there. Well, I've decided that it's easier to collect cards for the Advances; while it adds to the component list, I get plenty of room to put the rules for each Advance on each card, making the game a lot more understandable. You won't have to contimually reference a sheet of paper to see what thye do,you just look at the card. I'll still tie the Advances to the Cities somehow; "you can have a maximum of 3 Advances per City". So they are still tied together, but much more loosely. And in un-bundling them, I can target Events more specifically to Advances or Cities. The addition of Advance cards also doesn't add TOO much component "cost," either, I feel. I was already using cards for Events anyway. What I'm REALLY concerned with is keeping the amount of UNIQUE components to a minimum. And I'm still on track to keep the bare minimum of components on the game to a deck of cards, a pencil, and a pad of paper.